Did you know that nearly one third of burglars go through a window when breaking into a home? They won’t break the window either because would just bring attention to them and that’s the last thing that they want. Most thieves just rely on unlocked windows to get in. 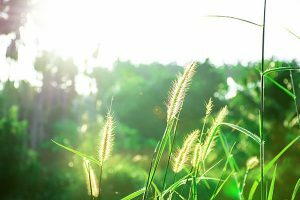 While almost all windows come with a lock nowadays, rarely are they sufficient when it comes to a break in. Thankfully there are many aftermarket locks that work great on a wide variety of windows. Each lock relies on a different mechanism for action, allowing you a choice on what works best for you. When installing a new lock to a window, it’s best to keep in mind that not all of them need to be reinforced. Most second story rooms are already typically hard to get to, so it’s not necessary to put a lock on them. When wondering what windows need one, it’s best to look at what’s most easily accessible – any room that’s a bedroom or not protected by a fence should have a lock on it. Really small windows don’t necessarily need to be secured, unless they’re located near other windows or doors. When in the market for a window lock, keep in mind that there’s a wide variety of them across many different price points. 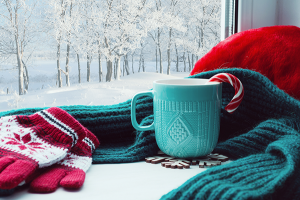 Also look out for ways to make your home safer outside of just window locks – think along the lines of trimming back trees that are overhanging your house, getting a security system and keeping at least a couple lights on when you’re away. Each lock variant relies on a different installation method and mechanism for action. They’re also rated on grade scale typically from one to three. Level three locks are the most inexpensive and, as a result, the least effective, while two is an intermediate that’s useful in most situations. The creme-de-la-creme of locks are those rated as a one. Traditional window locks are those variants that are directly installed onto a window. These types of locks can be part of the window at purchase or installed afterwards. If they’re added after the fact, expect to use a drill, screws and washer to attach them. The most common of these by far are the window latches. These simple locks are usually attached to one part of the window and are interlocked with a secondary mechanism to keep them together. For a more advanced and reinforced variant, there are keyed locks – which not only be found on single and double hung windows, but also siding glass windows. As the name suggests, these locks rely on a key mechanism. Thanks to this they can be broken into via lock picking, though this is extremely rare. Swivel locks on the other hands are a self locking mechanism that activate after the window is closed. When you need to unlock the window just turn the little snib from left to right. More primitive but extremely effective locks can be found in the window pin. These locks rely on a long chain – with one mechanism attached to the frame and the other to the window itself. When locked, the chain connects from the frame to the window. This stops anyone trying to open the window from outside by the tautness of the chain. These variants are also available in a restrictor cable that can be keyed. Other simple locks rely on a folding contraption to work. With a simple flick these locks can be activated and allow for complete protection by just putting pressure on the frame. While traditional locks are attached directly to the window, these unconventional versions rely on tapes and glues to be applied. Being aftermarket, they aren’t perfect, but rather work for a wide variety of different windows – and thus should only be used on a case by case basis. Child safety latches for instance can be used as a type of secondary lock. These latches work so a window can only be opened so much. Originally designed to make sure the children can’t get out, they can also work great for disallowing intruders from getting in. 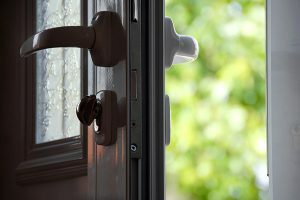 Sliding window locks are some of the best for preventing burglary for patios. This type is a long stick made from either metal or wood placed inside the track. Despite its simplicity, it’s actually one of the most effective locks as it doesn’t rely on any breakable mechanisms. Even more simplistic and requiring almost no tools for installation are aluminum clips. These variants attach to the edges of the window with a simple thumb screw. They’re one of the cheapest locks on the market today. For a lock that’s attached via velcro strip, there’s the window wedge. 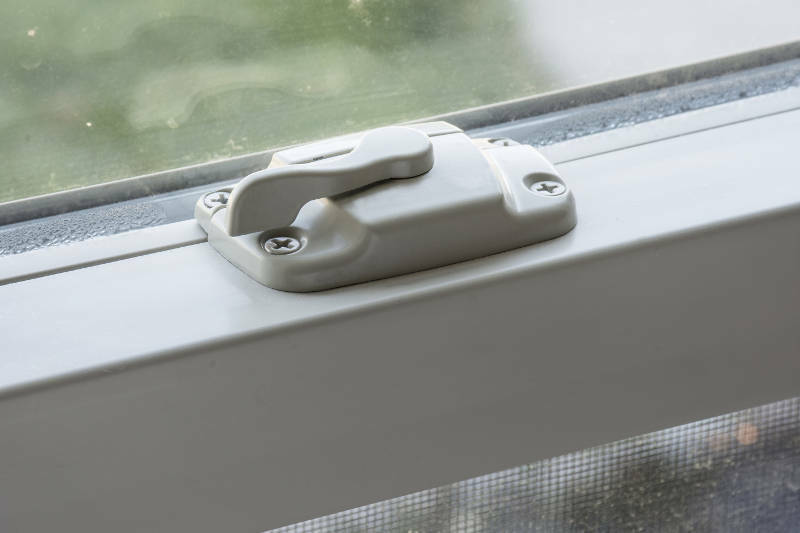 These are put on the inside of the window frame and because of this, they can be modified so the window can be opened at a set level. Probably to the best DYIers, window locks are a simple set of lag screws. By merely drilling in a set of holes into the side of the window you can then use screws and washers to pin it down. Keep in mind that this is a semi-permanent way to keep your window down, as it requires a drill to undo it. Being the 21st century, you can expect to find a window mechanism that is wifi compatible. Often incorporated into home security system, these smart window locks look like sleeker traditional locks. These types of mechanisms can rely on bluetooth, allowing users to unlock them using an app on their smartphone. When it comes to doors, many of them still have physical keypads to get in. You can often find these type of window locks in the form of the most common styles – expect to find traditional latches, door locks and sliding glass doors bolt locks. Many of these devices can also be incorporated into your smart voice assistants like Amazon Echo and Google Home. While locks have become standard in many windows, not all of these are a high grade. Reinforcing your existing windows with an extra set of locks can be cheap, easy and offer a greater peace of mind. There’s a plethora of choices when it comes to the type of lock that you want – whatever you purchase try to be mindful of the grade quality. Anything labeled with a one has superior craftsmanship and durability, but will be more expensive. If you’re in a pinch you can just invest into simple aluminum clips, wedges, or a pair of lag screws to get the job done. If you’re a more tech oriented person, you can rely on the newer smart window locks to integrate into your home security and assistant system. Remember, a lock is only as good when it’s actually flipped on – so be sure to take the time to lock those windows! It doesn’t matter how good your locks are if your windows are old and worn. You’ll need to replace your windows to improve your home’s security. Thankfully, Feldco is here to help. We’ve served over 350,000 homeowners and installed over 1 million windows. 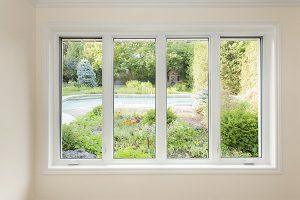 Get a free quote now and start your replacement window project today.